I have been pleased to work with the British Lung Foundation to table a Statement of Opinion in the lead up to World COPD Day on 21st November. 1.Notes that November 21 2018 is World COPD Day. 2. Notes that 8% of the population are living with a lung condition; 70,000 with COPD. 3. Notes that exercise and self-management is the most effective way to improve someone’s quality of life. 4. Notes the British Lung Foundation’s work in promoting and providing services, such as Singing for Lung Health, to give patients access to a range of self-management tools. 5. Welsh Government should ensure LHBs, local authorities and other partners invest in local exercise provision for respiratory patients, including in alternative options such as singing. Other AMs can now sign up to show their support for this work. What is COPD? Well it is a lung condition and you can read more here on the website of the British Lung Foundation. 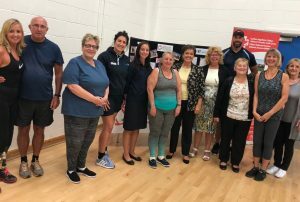 I discussed COPD during some of my recent constituency visits, both in the National Exercise Referral Service in Merthyr (see below) and with physios at Prince Charles hospital. Thanks to Rhys Taylor at BLF for his support.